The debate rages on, but the infantry automatic rifle will soon join the war in Afghanistan. Marine officials announced last night that 1st Battalion, 3rd Marines, out of Marine Corps Base Hawaii, will deploy to Helmand province beginning today. They’ll eventually take over in country for 2nd Battalion, 1st Marines, out of Camp Pendleton, Calif., which has patrolled Garmser district since the fall. The deployment by 1/3’s Lava Dogs will serve as the first war-zone test for the 5.56mm M27 IAR, which could eventually replace the M249 squad automatic weapon on many infantry patrols. 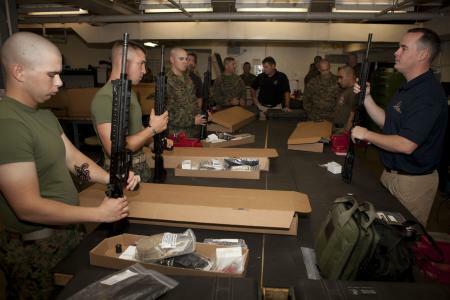 For now, it’s expected the unit will take both the IAR and SAW to war, covering its bases as Marines assess the auto-rifle’s strengths and weaknesses. Four other units received the IAR as part of an experimental fielding, and will deploy later this year. They include 1st Battalion, 9th Marines, out of Camp Lejeune, N.C.; 2nd Battalion, 4th Marines, out of Camp Pendleton, Calif.; 1st Light Armored Reconnaissance Battalion, out of Pendleton; and 1st Battalion, 25th Marines, a reserve unit out of Fort Devens, Mass. The units were expected to receive a total of about 458 rifles as part of a new round of experimental testing called for by Gen. James Conway before he retired as commandant in October. The Corps has tentative plans to buy about 4,100 M27s, but Conway called for the limited fielding first. Like a number of other grunts, Conway was concerned the new weapon, carrying a 30-round magazine, would not provide enough firepower to establish fire superiority in combat. The SAW frequently carries a 200-round drum of ammo. IAR proponents say the lighter weapon will allow Marines to maneuver under fire better and increase accuracy. If you’re in a unit that’s working the IAR into its predeployment workups, we want to hear from you. Drop me a line at dlamothe (at) marinecorpstimes.com. WHAT ABOUT THE 3/4 MARINES OUT OF 29PALMS? THEY DEPLOYED 4/6 TO SANGIN, AFGAN THE MOST DANGEROUS OF IT ALL. You know, Tom. Wake up. 1/3 is the most deployed unit in the Marine Corps. I’d know. My brother and fiance are doing this for the second time. Don’t degrade their battalion because of your issues with 3/4. They aren’t going over there to play pool. They are going to do their jobs and if you think they won’t be in any danger, your wrong. Say whatever you want, Tom. My Marines aren’t going over there to do landscaping. They are going to war, where people get killed, no matter what battalion your in. Enough said. They all need to be prayed for. This was taken out of content. I agree THEY ALL NEED OUR PRAYERS. All I wanted to do is ask why weren’t they mentioned. All of them are hero’s and should be metioned. all I wanted to say is they all should be mentioned. Thanks for reading. This was a blog entry about a specific unit taking a new weapon to war. Hang around — you’ll find we touch on just about every battle downrange on occasion. Christian, I wouldn’t worry about the new weapons. It’s an interesting aspect to the deployment, but they’re expected to take both the SAW (the old weapon for automatic riflemen) and IAR (the new one) with them. They’ll be assessing the new rifle during their deployment, but they have plenty of other missions. My son josh deployed yesterday for the third time. I am so proud of him. He is based in hawaii. What is different this time is besides his wife,lexi he leaves his newborn son, rylan. Lets get this stupid war over with and bring our men and women home where they belong. Hi Dan, Thanks for the article. My son deployed with 1/3 Alpha on April13th. He carried one of these with him along with what he told me was his M16. I did not realize it was a new weapon to test. I have a few photos you may use if they are useful to you.